Samples from "Get Up Now"
Toy Shop is a creative and entertaining band whose songs combine elements of rock, jam, and lyrical pop, conjuring images at time comical, at other times introspective. 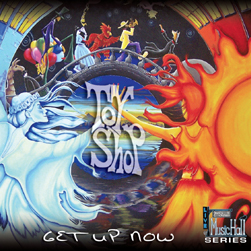 Legendary producer Johnny Sandlin captured the energetic infectiousness of the band's live performances, showcasing the quartet's musical talent, driving grooves, and vocal harmonies for Get Up Now, Toy Shop's premier release on Rockin' Camel Records. The Huntsville, Alabama based quartet was formed by British-born brothers, Antony and Andrew Sharpe, whose guitars and keyboards provide the template for Toy Shop's unique sound. The powerful rhythm section of Jim Kolachek on drums and Matt Ross on bass complete the lineup with a feel that blends intense rhythms with attentive subtlety. The emphasis of the band's live show set list lies within their own fresh and innovative original songs, and also includes covers spanning four decades from the Beatles, Pink Floyd, Tom Waits, Radiohead, Ben Folds Five, Phish, Neil Young, Peter Gabriel, and many other influences.